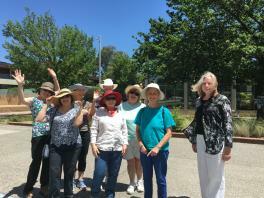 Acton Walkways holds a regular Wednesday lunchtime walk every week from 12:30pm-1:30pm. This is a social 45 minute to 1 hour walk, with different routes taken each week, exploring scenery around Acton and the Lake. From April 2018, to explore some new scenery a little further afield on the Acton Peninsula we are going to start and end our Wednesday Walks at University House rather than the Street Theatre. All are welcome - we look forward to seeing you there! Bookings: You can just turn up, though ideally please email or phone to confirm your attendance, so if you are running a little late we will know to wait for you. If the walk is to be cancelled due to bad weather, a notice will be put on the What's On Calendar at least 1 hour prior. Contact: Email: info@actonwalkways.com, Phone: 0437 301 390. For all enquiries, or to confirm tours in the case of bad weather, please contact us. To ensure we leave on time, please arrive at the meeting point 5 minutes prior to the advertised start time. We strongly advise you to wear covered walking shoes, and bring a hat, sunscreen, sunglasses and water. In addition to plenty of fresh air and scenic views, there will be some low level bush terrain and inclines, requiring moderate levels of fitness.